Chiocchetti, Paolo and Frédéric Allemand (eds) (2017). Competitiveness and solidarity in the European Union: interdisciplinary perspectives. Abingdon: Routledge. ISBN:978-1-13854587-8. https://www.routledge.com/9781138545878. Starting in the 1980s, competitive pressures and the ideology of competitiveness have shaken and transformed traditional models of development, public policy, and governance in Europe. 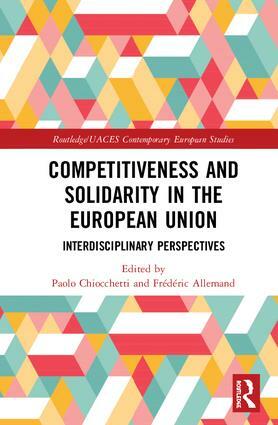 This edited book carries out a comprehensive, interdisciplinary, and innovative analysis of the relationship between competitiveness and solidarity in the contemporary European Union. It offers an original contribution to the scholarly debates on the current developments and challenges of welfare states, social and economic policies, and forms of governance in the European Union. Bringing together an international team of cutting-edge scholars in the social sciences and the humanities, Competitiveness and Solidarity in the European Union sheds light on the conceptual richness and policy relevance of these relationships, pointing to important avenues to make the European Union more economically successful and socially fairer. This book will be of key interest to scholars and students of European Union studies and, more broadly, of EU Law, Public Policy, Economics, Sociology, Political Science, Geography, and Contemporary History. The book is available for pre-order from Routledge. Make sure to enter the code FLR40 at checkout for a 20% discount (£92.00 instead of £115.00).